First off, it's a little weird writing about a band that is using your first name as their band name. You end up writing in a way that feels kind of awkward, as if you're somehow writing about yourself in the third person. Don't get confused though, Tim the band is full of energy, talent and great songs; so it's actually pretty easy to tell the difference between them and me. I came across these guys from reading the Wilfully Obscure website. That guy is just a treasure chest full of forgotten bands. I'm not usually as on board when he dives into the 70's and 80's, but he's constantly unearthing gems from the 90's and it's really essential reading to discover new bands. As far as Tim goes, I get the sense that they were just a couple of years too late. 1998 wasn't as kind to their brand of scrappy, upstart indie rock and I think the changing times (along with not being on a name label) is probably why they slipped through the cracks. If you put this record out on Merge or Alias in 1995, I think you have a classic record on your hands. Not that being on a bigger label would somehow make this record better. It wouldn't, but more people likely would have heard how great it is. 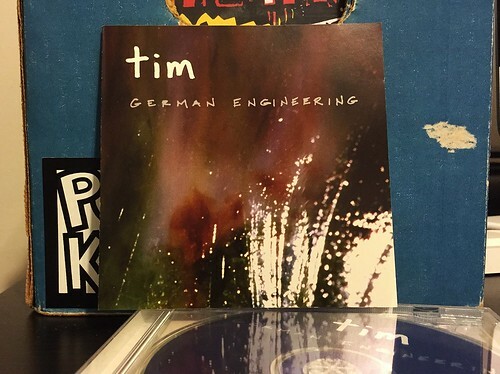 Tim has combined the searing, scratchy guitar antics of Archers of Loaf and mixed it with the melodic, higher pitched vocals of Superchunk. The resulting music is unquestionably influenced by 1990's Chapel Hill, but still manages to be unique and dynamic enough to stand up on its own. This is one of the best new to me old albums I've picked up in ages. Sadly, it doesn't look like it ever was put out on vinyl, but you can grab this CD used on amazon for a buck or two. It'll be the best two dollars you spend, I promise you that. Check out the only clip of their songs I could find on Youtube below, but also know this is probably one of the weaker songs on the record and the rest is even better.